The 1st ASA conference was held at the University of York in King's Manor, with over fifty students coming from all over the country helping to make the conference a great success. 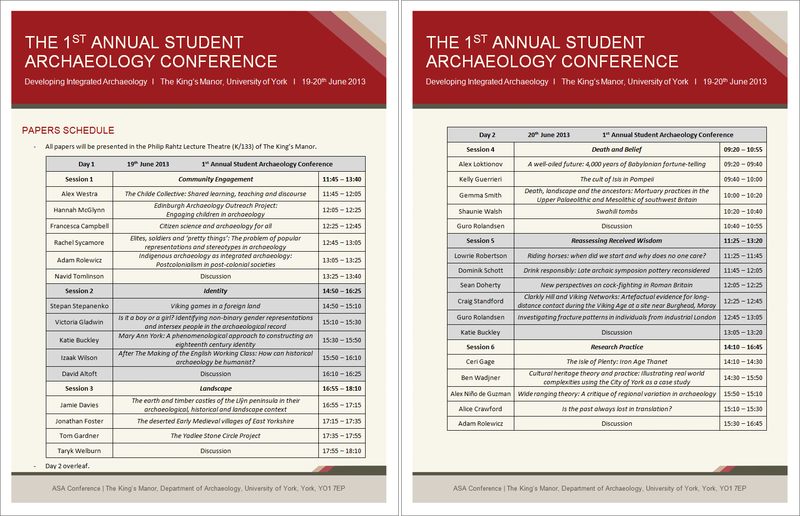 The conference theme, "Developing Integrated Archaeology", was designed to encourage and inspire different ways of thinking about the past, and emphasise the goal of ASA conferences to allow students to produce new ideas on the way we think about the past. The six sessions, spread out over two days, with a total of 24 presentations coming looked at a wide range of topics with room for debate, pod-casts of which can be found here on our website. More details about last years conference including session and paper abstracts for this years conference can be found in our conference welcome pack.